At Aqualine we always strive to be the best. Best suppliers to the industry, best service to our customers and the best products to the end user. So we are proud to announce that we are now suppliers of Apollo Backflow Prevention Valves to the industry. 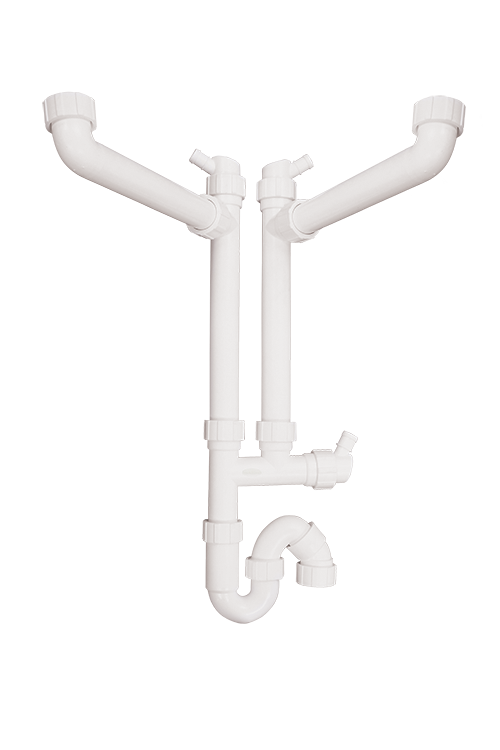 Apollo (Conbraco Industries) has been around since 1928, and are the leading manufacturers of flow control products for the U.S and international markets. 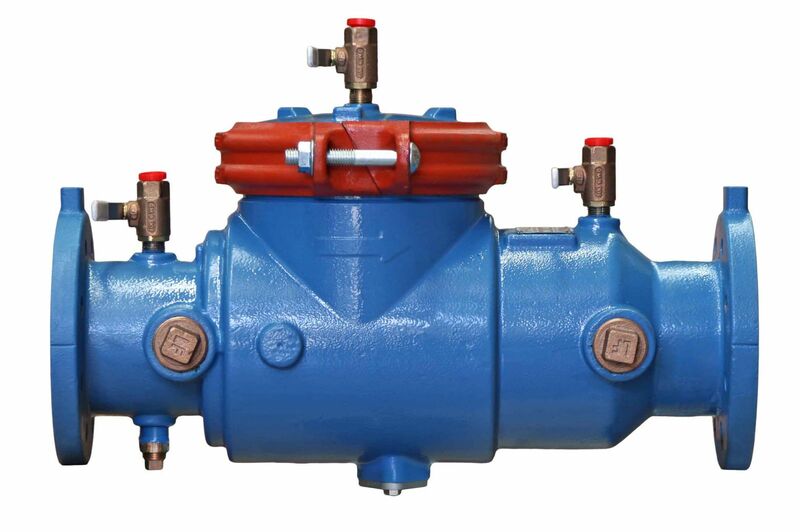 Today, Apollo Valves are proudly the only Backflow Preventers that are completely made, assembled and tested in the U.S.A, with manufacturing plants and foundries located in Pageland and Conway, South Carolina, and headquartered in Matthews, North Carolina. 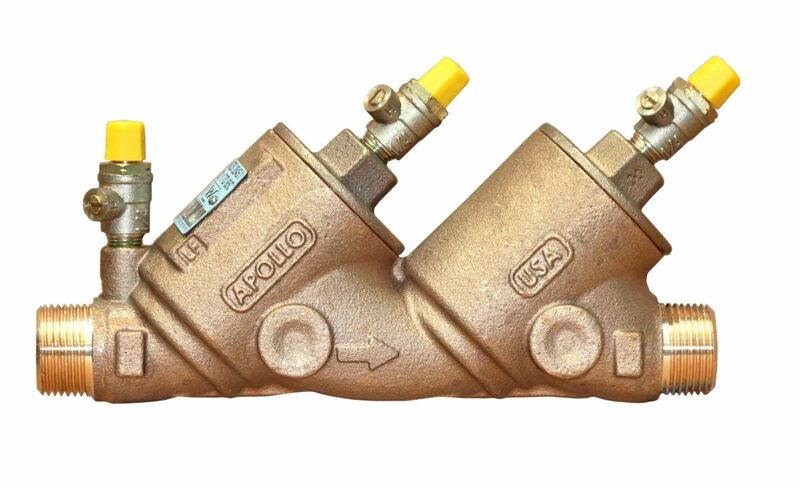 With the best flow rate, by far the easiest to service and a 5 YEAR WARRANTY, makes Apollo Valves Backflow Preventers the best choice in the market. All products carry the WATERMARK stamp of approval, giving the end user the assurance of an quality approved product. Just another outstanding product proudly brought to you by Aqualine, making it easy. 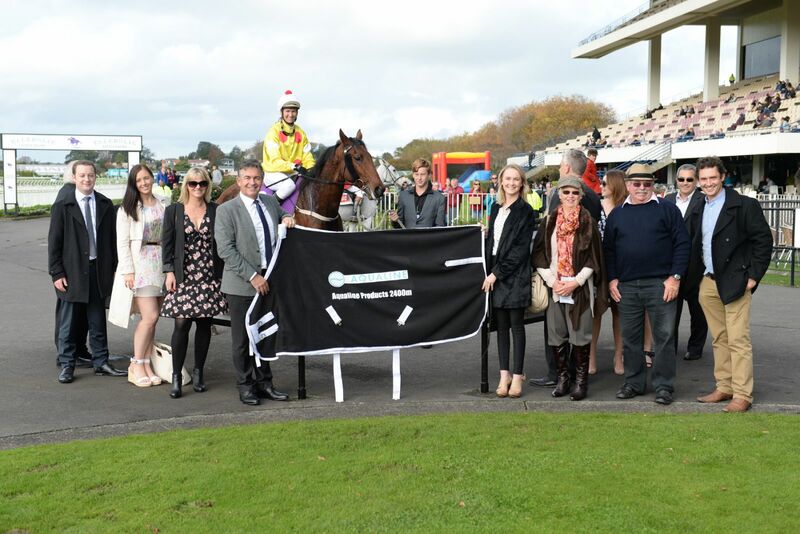 Aqualine were lucky enough to have the opportunity to sponsor the 2400m race at the Mico and Cure Kids race day over Queens Birthday weekend at Ellerslie. The winner was number 6 a horse by the name of Joking. The day was a great success and raised valuable funds for Cure Kids. Aqualine is renowned for its innovative products. The Aqualine Brand has been reinvigorated to reflect the quality products that Aqualine produces and supplies. This new brand is iconic, strong and relevant to the business and its customers. It’s one that works across multiple platforms and is flexible and timeless enough to cope with the future. Our logo is much more than an identification device, it is a trust mark specifcally designed to reflect and capture the values and personality of our brand. By using it consistently it will become a powerful symbol of our values. 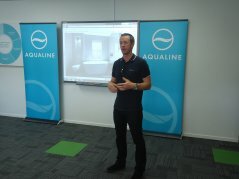 Aqualine are very proud to have a Kiwi icon in Greg Murphy launch our new brand. John Alexander then spoke about the fresh new Aqualine encompassing Spartan and Plumbpak. Darren then showed how the new Website worked along with the release of the new catalogue. Every year Aqualine participate in the Koru Kids Charity Christmas Cruise and Party where 180 special needs children get a chance to experience things they would not normally have a chance to do. Aqualine encourage their staff to get involved and personally be part of the charity. 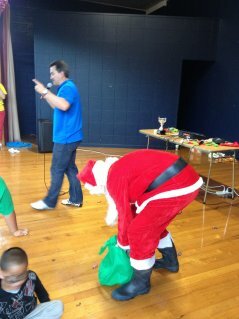 Every year Aqualine pay their staff to help with this event and become part of this great day for the kids. This year for Valentines Day the ladies will be treated to something special. A date with Greg Murphy. Open only to Mico customers, Aqualine will be bringing Murph to Mico Te Rapa on Valentines Day. Here is your chance to meet a Kiwi Legend. Contact Mico Te Rapa, or any of the Waikato's Mico branches for an invite and make sure you bring your camera. When to use a Code of Complience form and Gas Safety Certificate. This course is worth 12 points and available free to the industry. Contact your local merchant to organise a course. Aqualine Support "Key to Life"
Aqualine supported the "Key To Life" Golf Tournament played at The Grange. Mike King is the ambassador for youth suicide and the team enjoyed playing with “The King”. Aqualine are proud to sponsor an iconic kiwi legend. 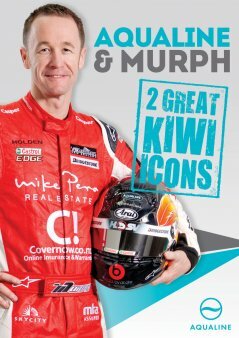 The 4 time Bathurst winner and current V8 Supertourer driver has teamed up with Aqualine to promote the "Great Kiwi Icons". Murph needs no introduction, but the name Aqualine is an icon within the plumbing industry. When it comes to brass fittings the plumbers ask for only one name, Spartan. The only kiwi icon when it comes to brass fittings. When it comes to traps, the Aqualine Space Trap is the only trap left that is made in NZ. The award winning Space Trap range is a true Kiwi Icon. Aqualine have been at all the Supertourer Endro races in 2012 and look forward to some exciting racing in 2013. Many lucky Aqualine customers have had hot laps with Murph. 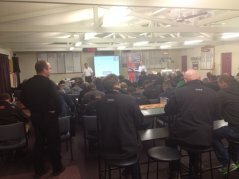 Greg Murphy dropped into Mico TeRapa to talk to the plumbers and staff about the upcoming Supertourers and what the latest is with the V8s. He also gave out some "Murph" jackets and signed everything from clothing to an engine. 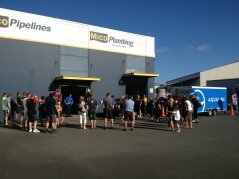 Aqualine's new warehouse in Christchurch is now open. Greg Murphy opened the warehouse to 200 industry guests on Thursday. The South Island now will get overnight service and Christchurch merchants can now pick up stock if they get short. Patrick Richardson will run the Christchurch operation.